I am on my way back from Rajahmundry to Mumbai. Right now I am transiting through Hyderabad but there's only one thought ringing through my mind since today morning - the incidents that occurred at Rajahmundry airport, that are so symptomatic of the malaise that ails our great nation. 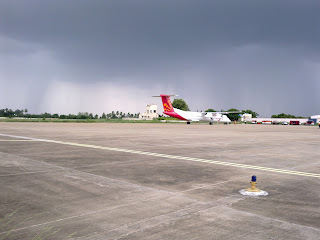 Yesterday, our contingent flew into Rajahmundry at around noon. The airport was swarming with security personnel. We were told that the Chief Minister of Andhra Pradesh, Kiran Reddy was to visit the city and the posse of security men were preparing for this visit. This morning, our contingent was split into two groups for our return. 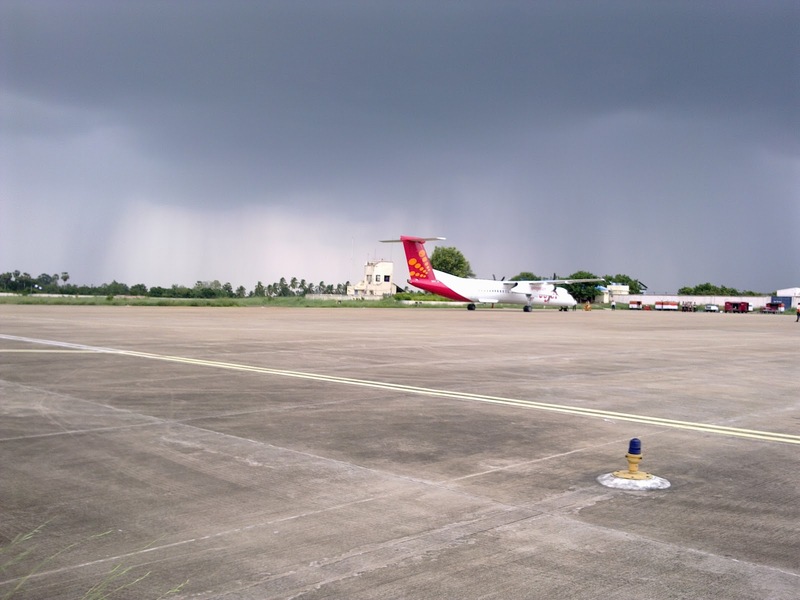 One was scheduled to take the SpiceJet flight back to Hyderabad at 1100 hours while the rest of us were on the JetKonnect flight at 1250 hours. We were advised that since the Chief Minister's cavalcade is likely to clog roads, we should reach the airport by about 1130 hours. We went as per the advised plan and reached the airport at about 1115 hours. The airport was full of policemen, firefighters and party workers. 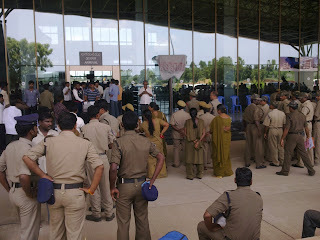 It seemed that the entire security force of Rajahmundry city was here. Petty criminals must have had a gala time in the city, I suppose(?). Our bus was stopped a kilometer away from the terminal on the pretext of security. It was sad to see people with little kids, the elderly and the invalid people lugging their bags to the terminal, while the securitymen and Congress party workers we're busy - gaily chatting away and some were shamelessly ogling female passengers. Imagine, these are the guys whom our politicians rely on for their power! The entry into the terminal was chaotic, it was clogged by party workers waiting to meet their "Dear Leader" - for a moment I thought I had been teleported to North Korea. After a smooth check-in and a rather fast security check, we were surprised to see members of our group who were scheduled to fly on the SpiceJet flight were still waiting in the security hold area, as their incoming aircraft, from Hyderabad, hadn't yet come in. It was delayed by over an hour presumably because the Dear Leader had turned up late to catch his SpiceJet flight from Hyderabad! Imagine the plight of the passengers on board - the Q400s like the ATR72s do not turn on the airconditioning till the engines. The passengers would have been drowned in their own sweat, all because of some insensitive and uncaring politician. Would SpiceJet have ever waited for you (or me, or anyone like us) even if we were 5 minutes late? In some time, the SpiceJet Q400 turboprop made a smooth touchdown. The excitement of the Congress partymen was audible with loud squeals of joy being heard at regular intervals. A few politicians, clad in spotless white from head to toe entered the security hold area and insisted on boarding the SpiceJet passenger bus, much like a hijack - they wanted to drive down to the parking bay to welcome their "Dear Leader" as he alighted. They were carrying bouquets and angavastrams to welcome the incoming VIP. After the welcoming festivities were over, the CM and posse of at least 15 securitymen, a few bureaucrats and number of white-clad Congress exited the SpiceJet bus at the terminal. Again there was another round of garlanding and what not. I was aghast at the lack of sensitivity to the public. The entire state machinery was put at the disposal of a politician, who in all likelihood would be detached from the public. Such is the crap that these politicians throw at us - a self-serving system that thrives on crony-capitalism, has been created depriving us, ordinary citizens, of our very basic rights, without any accountability to anyone. All this while giving an outward impression of purity by donning spotless white! I felt similar trepidation when I was scheduled to leave from Kolkata on the same day that Hillary Clinton was scheduled to arrive there. Fortunately, she arrived much earlier than had first been reported, so by the time that I arrived at the airport (late in the evening) everything had returned to normal--government agents doing nothing but taking up space. The sad reality is that government does not exist to protect us, it exists to protect itself.